Hey there! We are sure that all of you are excited to dress your best to be the ‘Perfect Package' this Diwali. 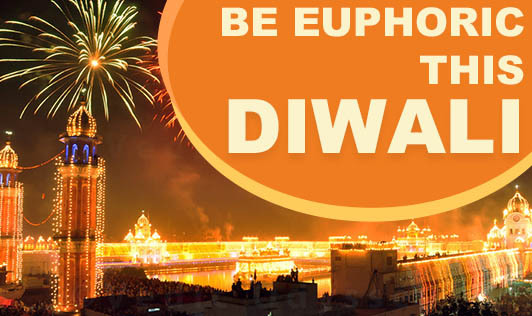 Diwali is the festival of light and also the most awaited festival for all age groups. It has been a tradition for all the members in the family to wear their best traditional outfits. Here are some style tips for this Diwali so that you can celebrate it with vibrant colors and look your best. • Choose bright colors or wear monochrome traditionally styled anarkalis which are undoubtedly classic and timeless for the girls. • In sarees, it can be the age old classic kanjeevarams which you can pick from your mother's wardrobe and team it up with a contrasting brocade blouse. • Readymade Lehenga sarees are also a good option. • Team up your outfits with traditional earring like big kundan jhumkas to add a traditional touch to your look. • Wear bangles to enhance your look. You can also accessorize with a light neckpiece. • You can accessorize with embroidered handbags and clutches. • Foot wear can be mojris, wedges or stilettos with vibrant or metallic colors. • Wear minimal make-up and add gold or silver jewelry according to the colors of the ensemble. • A Sherwani or a silk kurta with a stole in a complimenting color will look good on men. • Prints on the sherwani will enhance the outfit but don't go overboard. • If your sherwani is bright coloured, try to keep the pant and stole in a neutral shade. • Opting for colors like deep red, burgundy and dull gold would be a good choice. • If you want to opt for a simpler look, go for a bright kurta with well fitted jeans. • The kurta -jeans combination looks smart and fashionable. • If you want to sport a trendy look, go for colors such as orange, turquoise, navy blue or olive green. • Match your foot wear with your attire (kolhapuris, jootis or mojris). • Complete your look with a watch. • Smelling good is equally important as looking good. Use the right perfume to suit your personality and smell great. Try these style tips and add a twist of your own style to make the perfect style statement this Diwali! We wish you a Safe and Happy Diwali..Cheers! !